What am I buying when I buy an activity voucher? You are buying a stylish gift voucher pack which you can hand or post to the recipient. This is their passport to a fantastic experience – one which they’ll never forget! The voucher pack is included in the price of each gift experience. 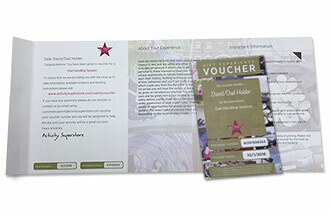 The voucher can be personalised by you with your own message. It comes with all the information needed to book the experience. Your gift pack will be sent by first class post on the same day if you order before 1pm Monday to Friday. Otherwise, it will be sent first class the next working day. Standard first class postage is £1.99 and special delivery for guaranteed next day delivery, providing your order is placed before 11.30am, Monday to Thursday is £5.95. * Special delivery is not available at weekends and delivery terms are subject to change over the Christmas period. Can I take my activity at any time? Vouchers are usually valid for up to 12 months. If you're unable to take your activity within this period, we will be pleased to extend the validity date by an additional 6 months, whilst the voucher is still valid, for a small administration fee. If our website price for your chosen activity has increased during this time you will also be required to pay the difference. When buying a voucher you are buying a face value voucher entitling the holder to choose, up to the value stated on the voucher, one of a range of activities supplied by the Activity Superstore and provided by selected suppliers.